We all want stuff. It doesn’t mean we’re all douchebags. (SPOILERS) I run a bit lukewarm on Noah Baumbach’s films. They tend to occupy a curiously diffident space, somewhere between sub-Woody Allen New York quirk and the kind of rather pedestrian, broader subject matter that fits easily into a much less indie, much more overtly Hollywood approach – just with slight tweaks to tone and casting. 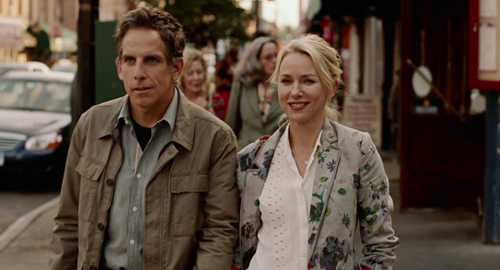 While We’re Young is very much of this ilk, hanging a plot concerning artistic expression that might have been lifted from Crimes and Misdemeanours from the peg of a middle-aged couple wary of their inexorable transition from youth. As such, there’s nothing very special here, aside from the performances. Even then, Ben Stiller’s Josh is recognisably Ben Stiller, the beta-male goofball we know so well from his major Hollywood roles, just a bit less off-the-wall and with fewer (a few fewer) pratfalls. His ensnarement into being flattered, and feeling validated/rejuvenated, by a young pretender (Jamie, Adam Driver) to his throne of eminent documentary maker is entirely predictable. Equally so that his ego must be brought crashing down when he discovers this usurper has used him to further his own career (using to him to hook up with Josh’s father-in-law, the inestimable Charles Grodin). There is consequent fallout on Josh’s relationship with wife Cornelia (Naomi Watts), and their ties with friends and recent parents Adam Horovitz and Maria Dizzia. Rather insultingly, Baumbach seems to be saying that such midlife restlessness can simply be cured by having a child, filling a gap of rather facile ennui. Jamie, with his less culpable wife Darby (Amanda Seyfried, very good) in tow, is a horrible hipster, a fellow who listens only to LPs and watches movies only on videotape. Good as Driver is, his character is a crude, Machiavellian, sociopathic caricature of a hipster, “It’s like he saw a sincere person and he’s been imitating him ever since” complains Josh. But then he concludes “He’s not evil. He’s just young”, as if Baumbach has resolved, shaking his head, that later generations just cannot be understood and so must be consigned to a moral vacuum. En route to this point, we encounter numerous faintly tiresome clichés of the mid-life crisis drama. Vignettes include couple-swapping (well, almost), drug-taking (ayahuasca), dancing to hip-hop and rote cod-psychology (Josh has been using his movie – a decade in the making – as an excuse not to do anything with his life, including having children). The amusing part is, the boring movie Josh is making actually sounds much more interesting than the one Baumbach has made, with it’s discussion of military interests creating the Internet as a part of an overall strategy (“Josh, you know, the whole world isn’t a conspiracy against you” levels Cornelia at one point). Albeit, this is all couched within a self-consciously mocking-yet-reverent milieu of pseudo-intellectual New Yorkers. 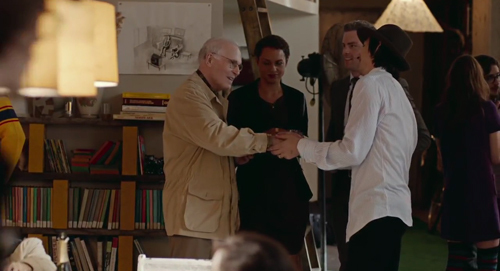 Worth seeing for Grodin (“You’ve made a six-and-a-half-hour film that feels like its seven hours too long”) and the players generally, but Baumbach’s too young (yes, he is) to descend into this kind of self-indulgent navel-gazing, particularly when he isn’t half as witty or insightful as the peak-period Woody he’s desperately aping.